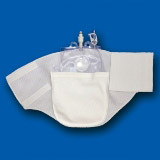 The Afex™ Leg Bag with Leg Wrap is the perfect combination for male incontinence. It's comfortable to wear and stays securely in place, completely eliminating the need for irritating leg straps and the possibility of slippage. The Leg Wrap is made of a breathable mesh that helps prevent skin breakdown and skin irritation. 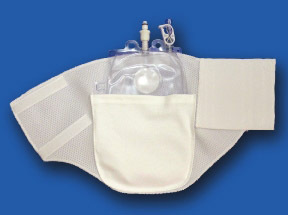 It has a pouch to hold the Leg Bag in securely in place and separate the bag from the skin. Wear the wrap and bag on the inside upper thigh area to make it virtually unnoticeable. It's machine washable and is available in two colors: white or black. The double-sealed Leg Bag holds up to 40 ounces and has a built-in drain handle for quick and easy drainage. The bag easily connects to and disconnects from the Afex™ Extension Tube, required for use with the leg bag and wrap. 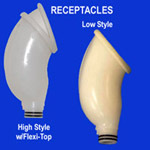 For more information about the Afex™ Extension Tube, click on the its link on the right sidebar.